I'm not getting into this whole debate, but I found a quote in this CNN article that gave me a quick giggle. 'To kill him is a way of making politicians look tough,' Jackson said. 'It does not make it right. It does not make any of us safer. It does not make any of us more secure.' 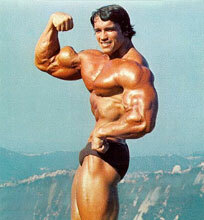 "
My question to Jackson... isn't Arnold Schwarzenegger the epitomy of tough? Here is some proof for everyone. Would you tangle with these guns? The only person looking tough in this whole situation is Tookie Williams himself as he sat on the table waiting for his trip up or down.